Learn how to use the popular open source Ubuntu OS and the Alibaba Elastic Compute Service tool by creating an email server. Postfix is a free, open source software application that works as a Mail Transfer Agent (MTA) for routing and delivering email. Dovecot is an Open-source MDA (Mail Delivery Agent) and is responsible for delivering emails to local recipients' mailboxes on a server. Dovecot implements IMAP (Internet Message Access Protocol) and POP3 (Post Office Protocol) and hence remains a good choice for accessing emails via Mail User Agents (MUAs) such as Squirrelmail, MSOutlook, Thunderbird, or Roundcube. 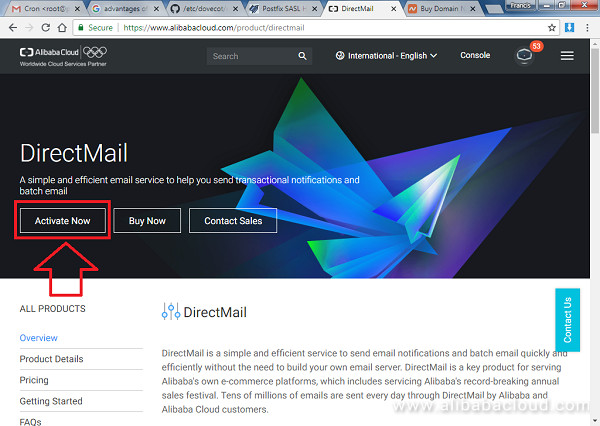 DirectMail is an Alibaba Cloud SMTP service for sending notifications and batch emails. The service is stable and affordable and charges depend on usage. In this guide, we will cover the steps for configuring a full-blown two way email server using Postfix, Dovecot, Alibaba Cloud DirectMail, and SquirrelMail on an Ubuntu 16.04 Elastic Compute Service (ECS) instance. For the sake of clarity we will use 198.18.0.14 as a hypothetical public IP address of your Alibaba Cloud ECS instance. An ECS instance running Ubuntu 16.04. Press CTRL+X, Y and Enter to save the file. Save the file by pressing CTRL+X, Y and Enter. Once we have setup a FQDN, we can now go ahead and install the Apache web server. This is very important because SquirrelMail requires a web server to function. Press Y and hit Enter when prompted to confirm the installation. We can now pull a free SSL certificate from Let's Encrypt using Certbot in order to enable SSL/TLS support on our mail server. You will be prompted to enter an email address for urgent SSL renewal and urgent notices. Enter the address and hit Enter. Next, press A and hit Enter to agree to the terms and conditions. If you would like to share your email with the Electronic Frontier, press Y and hit Enter otherwise press N and hit Enter. On the screen that appears, press TAB and hit Enter. 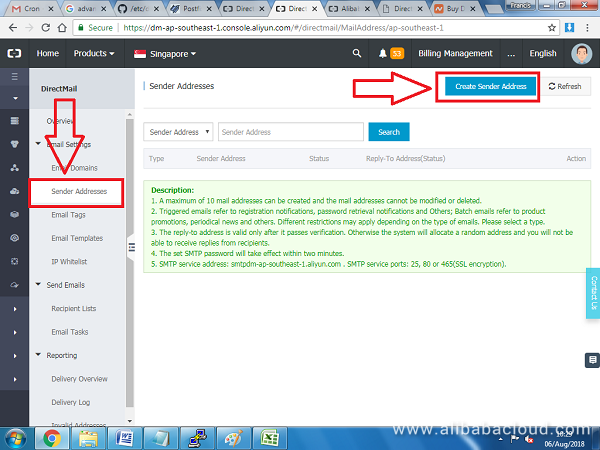 Then, select Internet Site as the General type of mail configuration, hit TAB and Enter. On the next screen, enter the name of your domain name (e.g. example.com and NOT www.example.com). Again, hit TAB and Enter. Next, we are going to make some few changes to postfix configuration files. Instead of editing the file /etc/postfix/main.cf, we will back up the original file and create a fresh configuration file. In the above file, we have instructed Postfix to use virtual_mailbox_domains located at /etc/postfix/virtual_mailbox_domains. We need to add our domain(s) to this file. You can add as many domains as you want in this file. The command above will create a new file /etc/postfix/virtual_mailbox_domains.db. Uncomment it by removing the pound symbol (#). Next, we will install Dovecot and all the necessary packages for IMAP, POP, and LTMPD. The latter uses Local Mail Transfer Protocol (LMTP) to deliver emails to local inboxes. When an email is sent to our server, Postfix will pass it over to Dovecot for local delivery. Also, our email client SquirrelMail will retrieve emails from local storage through Dovecot via the IMAP protocol. We are now going to configure Dovecot to make sure everything is working as expected. In the sections that follow, we will configure: mailbox location, IMAPs and POP3s protocols, LMTP socket, authentication, password files etc. $ sudo useradd -r -g vmail -u 5000 vmail -d /var/mail/vhosts -c "virtual mail user"
Enabling SSL on IMAP and POP3 protocol ensures the encryption between the email clients and our email servers to avoid exposing email login credentials to third parties such as Internet Service Providers (ISP). We can now go ahead and configure Dovecot authentication processes. The section disables any type authentication that tries to connect to Dovecot without SSL. Towards the end of the same file, we are going to change passwords and user database configuration. By default, Dovecot supports system level authentication. This means you need to create an account for every user that wants to access emails. Next, we can configure authentication for password file users. We need to edit the file /etc/dovecot/conf.d/auth-passwdfile.conf.ext. Press CTRL +X, Y and Enter to save the file. Remember to replace johndoe with your preferred username and example.com with your domain name. The last part (2MaishboR1) represents a password in plain text. 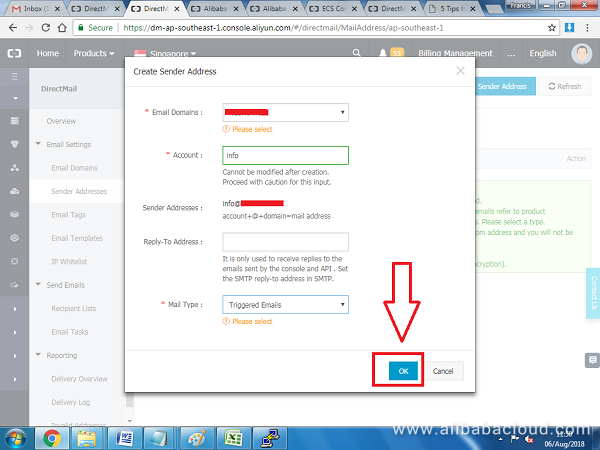 You will need the same password to configure an SMTP user account on Alibaba DirectMail so copy this value somewhere. 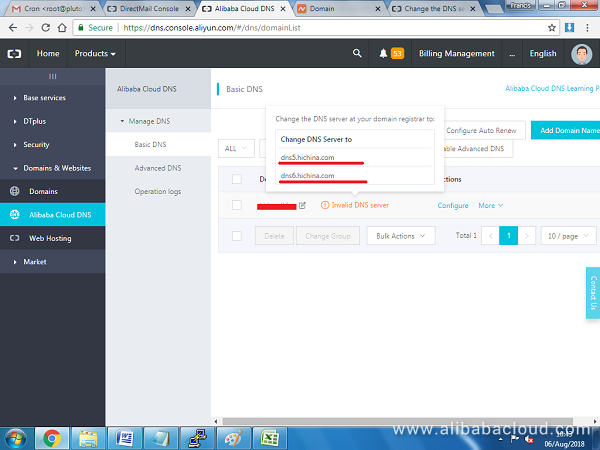 Outbound connection to Port 25 is disabled by default in all Alibaba ECS instances. 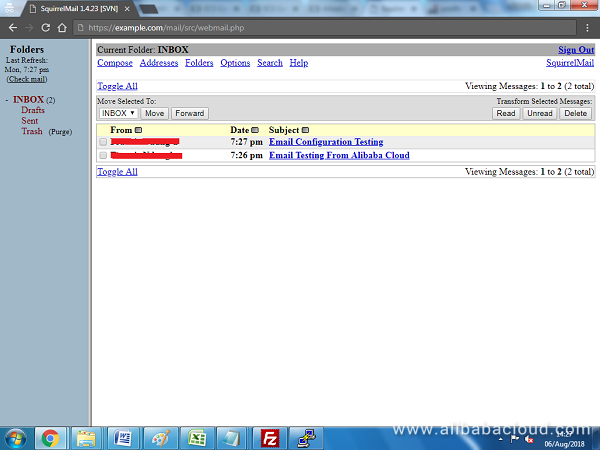 To overcome this problem, we will use Alibaba DirectMail for sending emails. The service works on port 465 and 80 for non-secure connections. However, incoming emails to our server will be delivered without any problems because port 25 inbound traffic is not disabled. 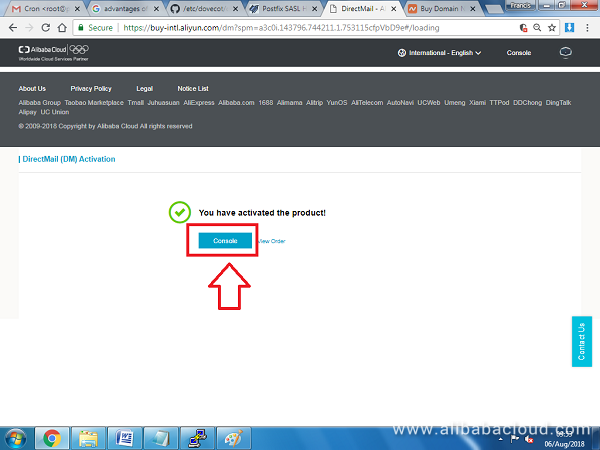 First, login to your Alibaba Account. Then navigate to DirectMail. Enter the new domain name and press OK. 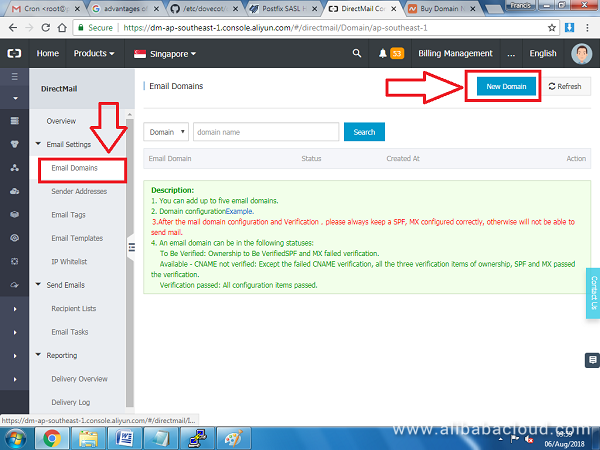 Your domain should be added on the list pending verification, click on Configure next to the domain name. On the next screen, you will see different DNS records that need to be added on your domain. You will need to add two TXT records, one MX record, and one CNAME record to verify the domain is yours. 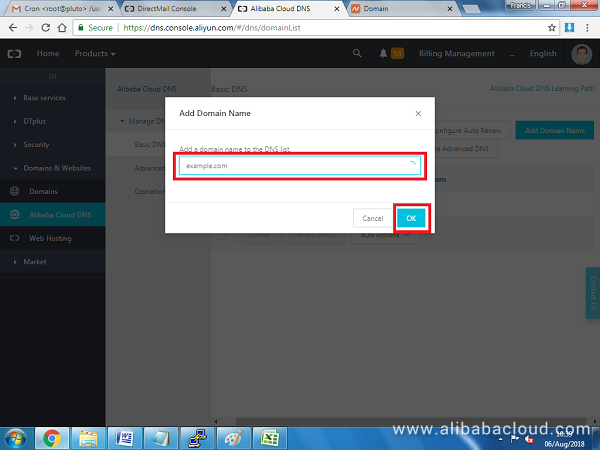 Next, we will use Alibaba Cloud DNS to configure the records. 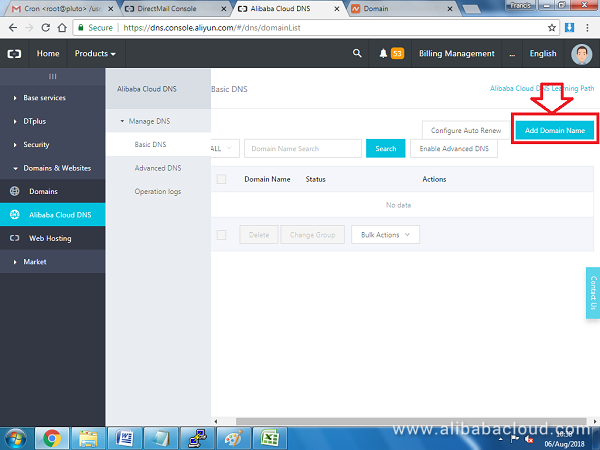 Navigate to: https://dns.console.aliyun.com/#/dns/domainList. Click on Add Domain Name if your domain is not already in the list. Please note an A record should point to the Public IP address associated with your ECS instance. Also, you should have two MX records. The first MX record should point to your primary domain name of your server in order for emails to be delivered and it should have a priority of 1. 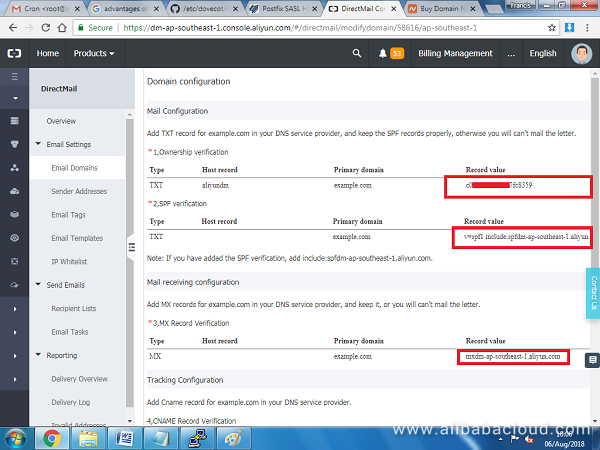 The second MX records should point to Alibaba SMTP server (e.g. mxdm-ap-southeast-1.aliyun.com) and should have a priority of 10 because it is used for verification purposes only. 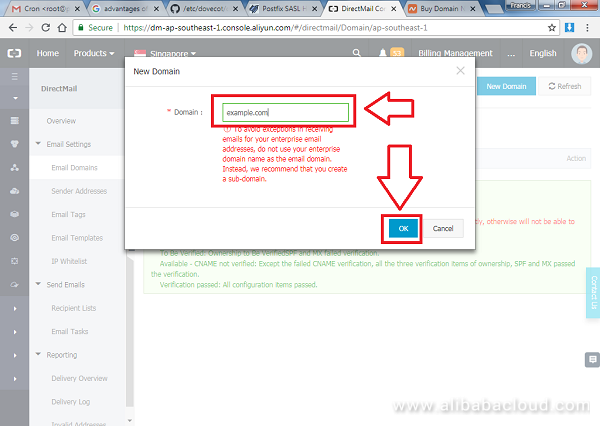 Once you have setup the DNS on your domain, you can now go back to Alibaba DirectMail to finalize the domain verification process and add an email account. If you followed the DNS setup section, your domain should be verified without any problems. On the popup window that appears, select the domain name that you previously added from a list box, then enter a username for your email address without the domain part, e.g. 'info'. On the mail type select Triggered Email. Click OK to proceed. Enter the password that you created when setting up Dovecot users. 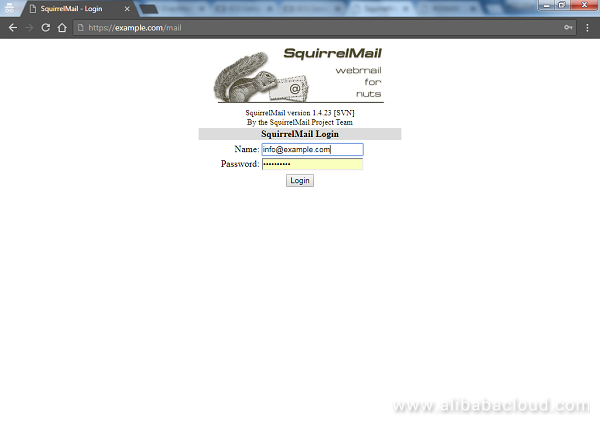 Next we can configure SquirrelMail client. The application is a good candidate for sending and receiving emails via SMTP and IMAP protocol and can run on any browser. Next, we are going to add the SquirrelMail path to the Apache's default virtual host file that has Let's Encrypt SSL certificate enabled. 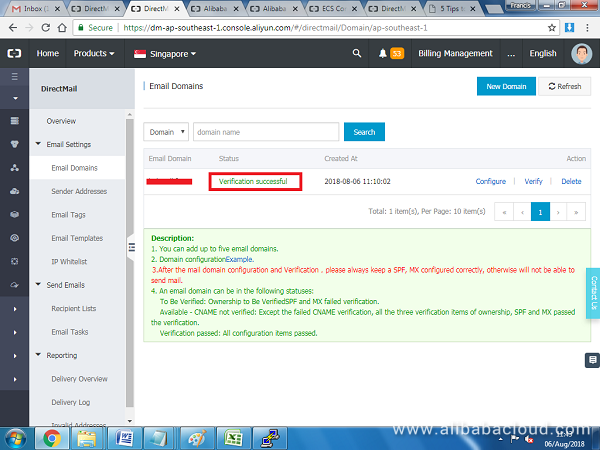 Also change the smtpServerAddress from localhost to the correct server name. 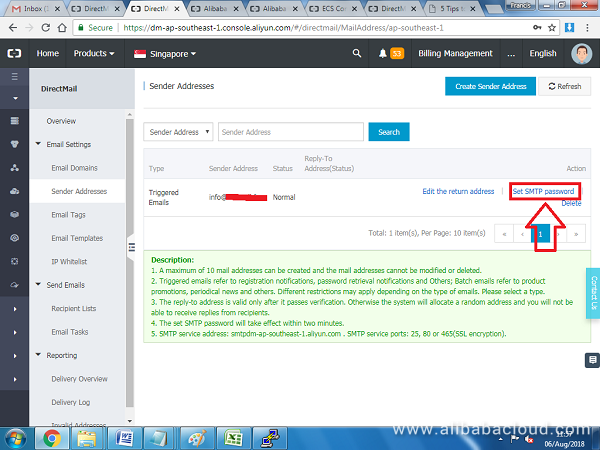 You can check the correct value on Alibaba Website depending on the data center of your DirectMail. SMTP port: 80(Non SSL) and 465 (SSL encrypted). Save the file etc/squirrelmail/config.php by pressing CTRL+X, Yand Enter. Once you are in the SquirrelMail dashboard, you can send and receive emails. Congratulations! Your email server is now working as expected. In this guide, we have taken you through the steps of configuring an email server with Postfix, Dovecot, Alibaba Cloud DirectMail, and SquirrelMail on an Ubuntu 16.04 Elastic Compute Service (ECS) instance. Remember, you are not limited to just one single email account. You can add as many email users and domains as you want. Also, the setup can work with any email client that supports IMAP/POP and SMTP protocols including Outlook and Thunderbird.